Asheville native Floyd B. McKissick (1922-1991) was a lawyer, businessman, and national civil rights leader. He was in school at Morehouse College in Atlanta when World War II began. 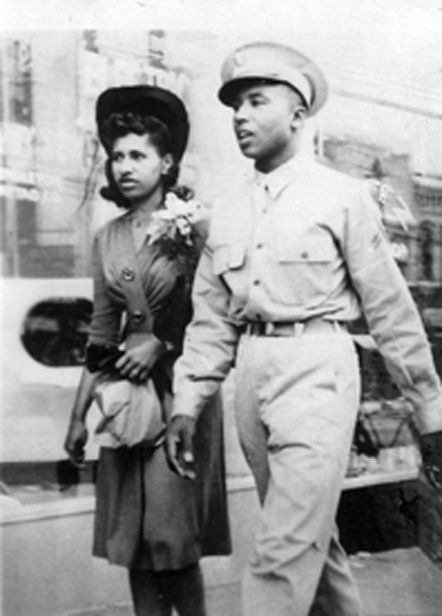 In 1942 he enlisted in the army and married another Asheville native, Evelyn Williams. Most of his army time was spent at Fort Bragg in North Carolina, teaching basic math and reading to recruits. He soon became a sergeant, but did not get accepted into Officers Training School. In 1944 he went to Europe as part of the 13th Engineer Brigade in General George Patton’s Third Army. He earned five Battle Stars and a Purple Heart and returned home determined that the time for first-class citizenship for blacks had come. He would spend the rest of his life working toward that goal.